An important part of leadership is taking care of your team. This story is a beautiful example of how taking care of others and helping them through tough times is beneficial for everyone. The focus of this story is U2 at their 1986 Tempe concert, and how a death threat almost led to them cancelling their second concert. Mark and I discuss (and disagree on) a couple of practice methods you can use to get better at telling your stories. Mark also shares a great bonus story that ties in with the theme of helping people during tough times. U2 band started in Dublin, they all went to the same school. Adam Clayton, the bass player, suffered from depression which led to alcoholism. He later reflected in life that his drinking made him hard to put up with, but the band did anyway and took care of him. They had just released the Joshua Tree album in 1987. They were in Tempe Arizona. Their last album was called Unforgettable Fire, and it had a song on there called Pride. The third verse in the song was about Martin Luther King and his tragic assassination. They were playing their Joshua Tree album gig on 3rd and 4th April, which marked the anniversary of Martin Luther King’s assassination (4th April, 1968). It was their first show of the tour and there was media attention. The day before the second concert, on the 3rd April, they received a death threat. The threat was: if you play Pride on the 4th April I will kill you. I have a gun and I will shoot you. The band told the FBI and they said that with this short amount of time there’s no way we can protect you. He might have a handgun in the crowd, there might be a sniper and there’s just too many scenarios at play. You have to cancel the concert. U2 are tough guys. They discussed it and decided to go ahead. They all get up to play the concert. Towards the end, they play Pride. As it came up to the third verse he was terrified. He closed his eyes and sang the words – “Early morning, April four | Shot rings out in the Memphis sky | Free at last, they took your life | They could not take your pride”. He said the whole time he was expecting a bullet. He got to the end of the song, eyes closed. He opened them and saw the bass player, Adam Clayton, who had been playing in front of him so that no one could shoot Bono. Welcome to Anecdotally Speaking—a podcast to help you build your business story repertoire. Hi, I’m Shawn Callahan. Now this week we’re doing a little bit of an experiment, we are going to jump straight into the story, no little chit chats before anything. I’m going to throw it over to you, Mark. What’s our story for today? Well our story today is about a band, a band that most people have probably heard about- U2 that started in Dublin. They all went to the same school and they weren’t great musicians when they started. They struggled at a bunch of levels and of course one of the things was that as they got famous and rich they had to struggle with how they dealt with that. So forward to 1987 and another hard time they faced. They were just launching the Joshua Tree album and they were in Tempe, Arizona, 1987. Not far from my brother. Exactly, he’s in Scottsdale isn’t he? So, their last album, ‘Unforgettable Fire’, had a song on it called ‘Pride’ and the third verse of that is about Martin Luther King and his assassination. They were playing their Joshua Tree tour; the first two nights were the 3rd and 4th of April and of course the 4th of April is the anniversary of Martin Luther King’s assassination. Because it was their first show of the tour they were there early in Tempe getting set up, practicing etc and there’s a fair bit of local media. The day before, on the 3rd of April, before their second concert they received a death threat. Essentially the threat was, if you play ‘Pride’ on the 4th of April I will kill you. I have a gun and I’m going to shoot you. So, this is some alt-right group or something like that? It’s not clear where the threat came from but that’s probably not an unfair assumption. The band told the FBI and the FBI said with this short notice there’s no way we can protect you. He might have a hand gun in the crowd, he might be a sniper, there’s just so many different scenarios that we can’t protect you, so you’re going to have to cancel the concert. 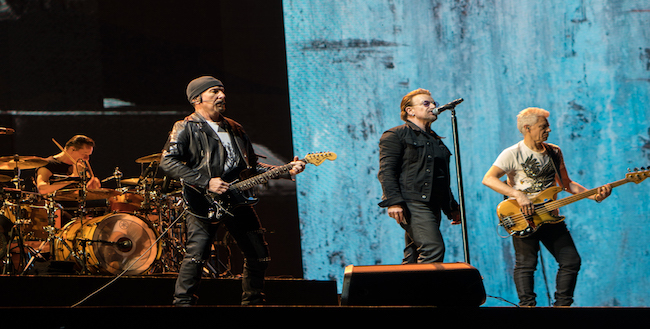 U2 are pretty tough guys and very principled and they went, ‘are we going to just cancel the tour and let everyone down because of this threat?’ And they decided not to. It’s a pretty tough decision. And Bono describes that they went on stage and they are playing the concert and towards the end they played ‘Pride’ and as it came up to the third verse which was the verse about Martin Luther King he was terrified and not surprisingly. So, as he comes up to the third verse he was just so terrified he closed his eyes and he said I sang the words ‘early morning, April 4, shots rang out in the Memphis sky, free at last they took his life but they could not take his pride’ and he said all the time I was just expecting to get a bullet in the head. And he kept his eyes closed till the end of the song, and he was okay and when he opened his eyes there was Adam Clayton, the bass player standing in front of him so that no one could shoot Bono. Yeah, how far would your friends go for you? That’s the sort of story that gives you goose bumps isn’t it? That’s a cracker so let’s talk then about why we think that story works. Actually, I was in a book store the other day with Sheena and I was just thinking in all these books there are so many great stories but where would you start if you were to collect a series of stories? Where would you start? I thought maybe you’d start by finding the stories around the most famous people or the most famous celebrities because as soon as you mention it people hook straight into the story. Either the name of the band or the celebrity so I think it’s got that element to it. Top 10 bands you might be interested in, U2 might be on it. U2 might be on it right and you’re likely to be able to tell that story in a whole range of places. Immediately they get the whole visuals, they see Bono there with the glasses, they see the edge on the right hand side, you know with that hat he has on. Yeah, so it gives you all those visuals just by saying U2 and Bono right. I certainly think that’s something that works for it. What else do you reckon? Well of course life and death, the tension of not knowing; is the bullet going to come? The closing of the eyes, I think that’s an important detail. Well it is. That detail is vital to the story. Of course, yeah and I think that’s another element that is, it’s unanticipated –you don’t know the bass player is going to be standing in front of Bono. And of course, you can visualise that as well, so again there’s a surprise element to it; a nice little twist to it right at the end of the story. I think too with a story like that we talk about power being something we are drawn to and celebrity power is definitely a type of power so you’ve got that element to it. I think too you are also seeing the character of the band, not cancelling the performance. It gives you that little insight into them, and you have that little bit of recognition and you go okay so that’s the type of people these guys are. What a fabulous story, I love it. I heard it a couple of weeks ago. I heard a guy tell that story and I did a bit of research because it was surprisingly difficult to find the information about it. I had to do quite a bit of digging; I would have loved to find a photo. Wouldn’t that be great, there has to be a photo of that snapped somewhere. Haven’t found it yet. Anyone out there whose got a copy or knows there’s a photo let me know. Yeah definitely. What do we think could be even better about that story? I have to say I felt a bit awkward saying the lyrics. You know the lyrics of that verse. So, what were you feeling as you were saying the lyrics? Well I was kind of feeling it was a bit rehearsed because I had to actually rehearse. To remember the lyrics. So, I wonder if I was telling that story in a pub, whether that would be authentic, people going oh yeah! Because we talk a lot about performance. In that we try to avoid performance in our storytelling. We think business storytelling is very much around just sharing the experience as if you would tell it to your colleagues on a day to day basis rather than delivering the most beautiful performance. We like the um’s and ah‘s, we like the bits where you have to back track a little and go ‘ah no I haven’t got that quite right’ or the bit where someone jumps in and goes ‘oh no no what it was, was… ‘ and then they correct you. I think that is how stories are actually told in business. Yeah, they are not beautifully polished diamonds. Not at all. I reckon that’s an interesting and important element for people to think about in their storytelling. I think it would be a real mistake for people to stand in front of a mirror and practice telling their story. I’m not sure that I agree with that. I think that’s a valid technique, not with the intention of getting it perfect but with the intention of just getting it out. And feeling what it’s like to get it out. You know that whole thing about practice. I think that just getting it out helps you get better at it. I’ve never done it that way I suppose. I’ve never stood in front of a mirror and done it but I have said it out loud on my own many times. Because I tend to practice by telling someone. I know my first version is going to be crap and I’m going to miss some key elements but the listener rarely knows what I know or what I’m missing. I make a mental note and I tell it again to someone else. I use real life telling. But you are right for the more complex stories there are specific names of things, dates of things that you know if you don’t get that right course the whole thing crumples under you. I think that whether you are practicing in front of the mirror or you are doing live practicing with somebody, the important thing is that you are doing it. You’re not just imagining yourself telling it in your head because that is the mistake. And I have done it. I have been giving a presentation, I’ve got my opening connection story all figured out and something happens and it reminds me of something, an absolutely smashing connection story, and so I tell it to myself a couple of times in my head and I go up on stage and of course all that comes out of my mouth is the first draft. So anyway, get it out, don’t practice it in your head. So, my brother and sister turned fifty last weekend and at the last minute said, ‘Shawn you should be the MC’. Seventy people turning up and yeah okay, I’ll be the MC; you know I’m a bit of a last minute person. On the day of the event I was thinking, okay what story can I tell which is about my brother and my sister. I remembered a story and I thought this would be a good story to tell. The thing that was most important to me was to get the point out, the bit why was I telling the story. My point was really basic, all I said was something like ‘we all know my brother likes to get ahead and likes to win but every now and then my sister wins’ and that was the beginning of the story. It’s no profound point per se but once I had that the rest of the story, because it was a family story it has been told multiple times, but most of the seventy people had never heard of it. But of course, what was lovely, it was this group telling, so my father told a bit, brother told a bit, it was this collaborative telling of a story, it was really quite nice but I guess my point though that I’m getting to is, if you know that point. We should talk about where would you tell this U2 story, what point would you make? There are so many leadership lessons in this. So U2 is a band but they take care of each other—many leaders don’t do that. A question for leaders; what have you done for your people today, last week where they might even remotely consider standing in front of you? I know there are many leaders who could put their hand on their heart and say they’ve done a lot but there are also a lot of leaders who go, ‘I’m sure I have’ but couldn’t give a specific example. I think that’s important and the other thing that’s related to that. If you were working with a group of leaders to help inspire them. I’m sort of repeating a point in a slightly different way aren’t I? It’s not really a new idea. It is important, it’s an inspirational story. And it’s a challenge to fix. Think about the things you do that cause your people to be so connected to you that they’ll do what you need at the time you need it. So, that’s one good application. What’s another way we could use that particular story? For me I think it’s a great illustration of friendship. You could talk about the fact that bonds are often formed in the toughest situations. If you’re going through a really tough point in a team’s life that in fact this could be the cauldron of forming the best bonds for the future of that team. So, if somebody is going through a difficult period, do you help them through it or do you cut ‘em loose? And in U2’s case they never cut him loose. Adam Clayton, they stuck by him because he was part of the team. That reminds me; a few weeks ago, I was running a workshop and a lady talked about a time back in 2012 when she was senior executive for a company. And she was given a list (in the form of a spreadsheet) and she was told this is a list of all the people you have to fire—140 of them. Pretty terrifying thing for somebody to have to do. I was quite impressed, she said it went against all of her values to do this and she thought seriously about just resigning and not doing it. But she knew it was going to happen anyway. Whether it was her or not. And she decided I’m going to do because I’ll do it the right way. And she did a whole bunch of things but one of the things that happened as part of this process—there was a guy on this list who had been a superstar for a long time. A high performer and had a few personal circumstances that were very tragic and he was being treated medically for depression so he was temporarily not a superstar. He was on the list. And she went, ‘I’m not putting him on the list; he’s a superstar’. So, she took him off the list. He didn’t get retrenched and he came back to work and he was a superstar. And he went on to become country head. Sticking by people when they are temporarily down paid off for Bono. Definitely. O.k. let’s give some ratings here. I think we forgot to do our ratings in the last episode so we’ve got to get back on track. I’ll start because you told the story. I’m giving this a 9. And the reason I’m giving this a 9 (and I think this is the highest score I’ve ever given) is that I know this is a good story because I’ve told it already at least six times. I love this story. It’s easy to tell. It makes a point. You can see the faces on people just like they’re gobsmacked. In fact, sometimes you even see people tear up. I did. I told the publican at my local pub on Friday night and she teared up. That is a great indicator of a pretty powerful story. What about yourself; where would you rate it? I’m going to give it an 8.5. 8.5, gee, you’re nearly getting to the 9 level. Yeah, not quite and that’s got nothing to do with how well I told it because it could be told a lot better. It’s simply because of the inherent characteristics of that story mean that anyone could tell that and have huge impact. Well guys, we’re going to wrap up pretty quickly here because this is the shortened version of our programme but as I’m looking at the time it seems as if we’ve still gone for some time chatting away. But I just want to thank everyone for listening to Anecdotally Speaking. And I want everyone to tune in next week for another episode on how to put stories to work. Bye for now.